The RUFSTER products and systems are always accompanied by a Warranty Certificate that is filled out for every order. As a producer we put trust in what we do and we wish that the customers enjoy the same trust and the confidence given by a quality product. 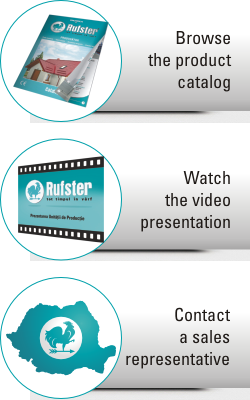 The RUFSTER products have a long life expectancy under natural typical environmental conditions. In order to ensure proper use and preservation of the products we recommend periodic maintenance by clearing residues and sediments that accumulate every season. The multi-layer coating system protects the material from the damaging effects of water, snow and UV radiations. It prevents the corrosion of the steel core thus securing the integrity of the roof or facade system. The surface treatment, which is the Polyester coating, is the element that gives the product its color and texture. Once purchasing a RUFSTER roof or wall covering system, the end user receives a written document that certifies the authenticity and quality of the products. The Certificate is issued directly by RUFSTER as manufacturer and will be filled in with the customer's details at the Distributor's point of sale. Considering the degree of complexity that is often present in installing our types of products, we strongly recommend that this be carried out by qualified persons with experience. Once you follow the usual conditions of transporting, storing, manipulating, installing and using our products, there is no reason to worry about the durability and functionality of the RUFSTER products.